According to a building information modelling video featuring its chief engineer Andrew McNaughton, the HS2 railway is to be a ’24-hour transport system’. But the same video says HS2 would be closed for maintenance between midnight and 05:00. So, on that reasoning, a shop that is open to the public between 08:00 and 18:00, but cleaned and restocked overnight, is a ’24 hour retailing system’. 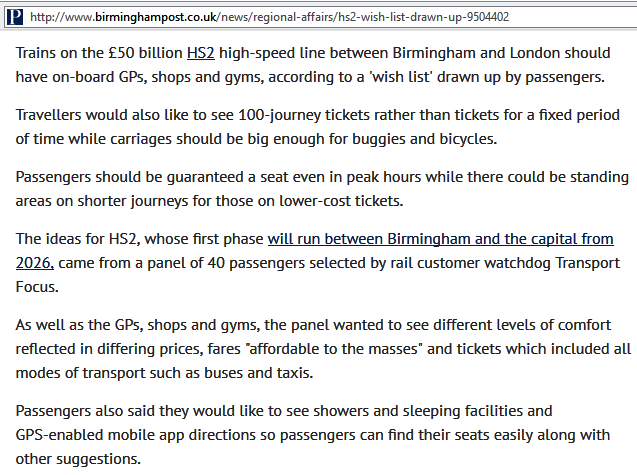 Trains on the £50 billion HS2 high-speed line between Birmingham and London should have on-board GPs, shops and gyms, according to a ‘wish list’ drawn up by passengers. The ideas for HS2, whose first phase will run between Birmingham and the capital from 2026, came from a panel of 40 passengers selected by rail customer watchdog Transport Focus. […] As well as the GPs, shops and gyms, the panel wanted to see different levels of comfort reflected in differing prices, fares “affordable to the masses” and tickets which included all modes of transport such as buses and taxis. Passengers also said they would like to see showers and sleeping facilities and GPS-enabled mobile app directions so passengers can find their seats easily along with other suggestions. […] HS2 technical director Professor Andrew McNaughton added: “HS2 will transform long-distance rail travel in the UK and that’s why it’s so important that we listen to what passengers want.